Western blot analysis of whole cell lysates probed with CD19 antibody (VMA00030) followed by detection with HRP conjugated Goat anti Mouse IgG (1/10,000, STAR207P) and visualized on the ChemiDoc MP with 37 second exposure. Arrow points to CD19 (molecular weight 95 kDa). CD19 antibody recognizes B-lymphocyte antigen CD19, also known as B-lymphocyte surface antigen B4 differentiation antigen CD19 T-cell surface antigen, Leu-12, or CD19. The antibody has been extensively validated for western blotting using whole cell lysates. Mouse anti Human CD19 antibody recognizes an epitope within the C-terminal cytoplasmic tail sequence of human CD19, a single pass type I transmembrane glycoprotein containing two C2 type Ig-like domains in the N-terminal extracellular region and four potential phosphorylation sites for tyrosine together with a single serine in the cytoplasmic region. Human CD19 is expressed on virtually all cells of the B-cell lineage with the exception of plasma cells and plays a regulatory role in B-cell differentiation and proliferation. B-cells are essential for antibody production and mutations in the CD19 gene can lead to an immunodeficiency syndrome, CIVD3 characterized by hypogammaglobulinemia leading to recurrent infections and the inability to mount an antibody mediated response to immune insult. Although immunoglobulin production is impaired, B-cell precursors appear in normal numbers together with some reduction in more mature B-cell forms (van Zelm et al. 2006). B-cells have also been implicated in the progression and pathogenesis of multiple sclerosis and are common circulatory components of both active and chronic MS lesions and well as in CSF (Ritchie et al. 2004). 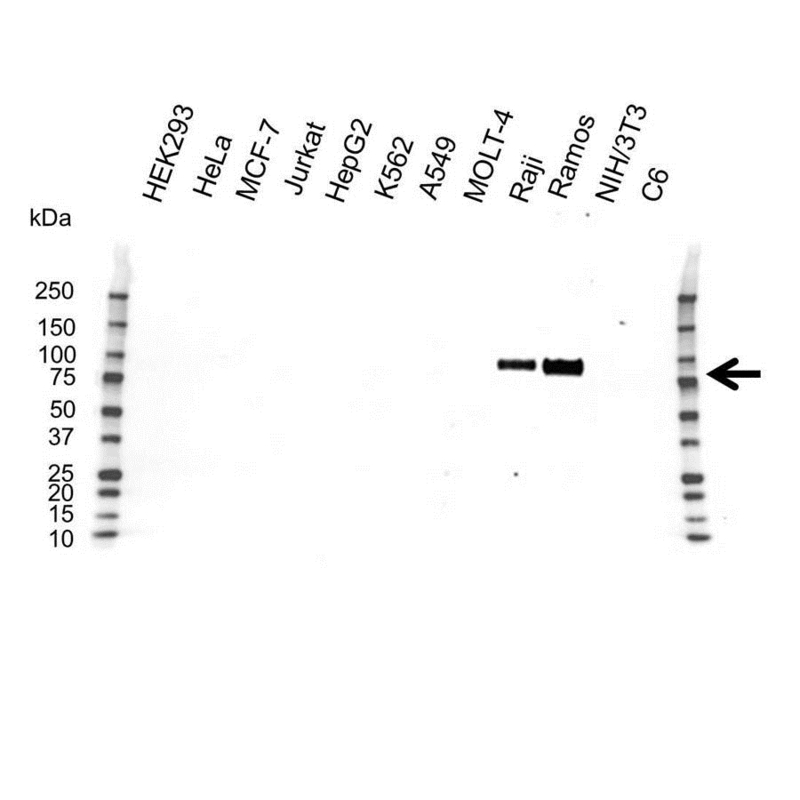 Mouse anti Human CD19 antibody detects a band of ~95 kDa in Western blotting using a Raji B-cell lymphoma cell lysate under reducing conditions. Anti CD19 antibody detects a band of approximately 95 kDa in Raji cell lysates.